Floral Street, Rose Street & Garrick Street, 1986. Photo © Paul Barkshire. This week’s offering on The London Column consists of Paul Barkshire’s limpid photographs of drinking establishments from the 1980s, accompanied by personal observations on city drinking by myself and – if we’re lucky – a few others. 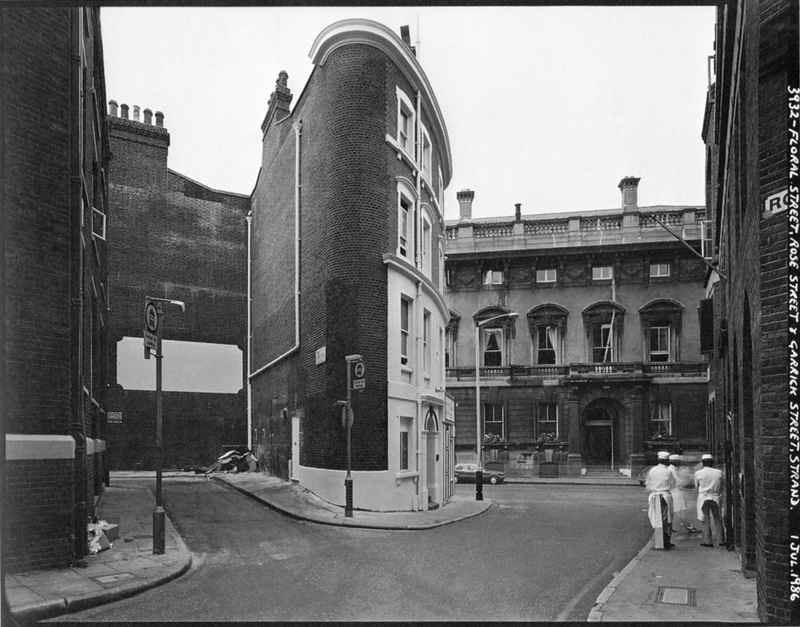 It seems appropriate to begin the week with this picture, which shows the convergence of three Covent Garden streets, the noble facade of the Garrick Club facing towards us, and – the reason for its appearance here – chefs from the kitchen of an establishment fondly remembered by your correspondent. They are standing in the doorway of what used to be the restaurant L’Estaminet, and its downstairs wine bar Le Tartin. L’Estaminet was established by the remnants of the team who had started the original Chez Gerard, the steak-frites operation on Charlotte Street. I would eat upstairs occasionally, but it was usually easier to stay in the basement bar. Behind the counter downstairs were Bernard and Gerard: the former bespectacled, austere, and slightly forbidding, Gerard an endearingly hectic shambles. A gamine waitress was on hand to smile at the patrons’ terrible jokes and give the middle-aged regulars dreams of a better life. Le Tartin was an oasis of calm amidst the frantic tourist clamour outside, offering a far more intimate experience than any other London bar or club I can think of. Sat at a booth one could drink and dream one’s life away in the gloom, and they would bring you merguez sausages if your reverie made you hungry. I was a regular there for about seven years, until that sad evening when my regular visit revealed the dead hand of new management (who went on to rename the venue The Forge). Bewildered, my colleague and I retreated to the nearby Le Beaujolais (another venerable French-run wine bar, although a much more raucous affair) where we were told the sorry tale of the departure of Bernard, Gerard et al. The staff of Le Beaujolais were sympathetic to our distress, because they understood what we had become: exiles. D.S. … for The London Column. Pictorial reports from the life of a city, 1951 to now. There Is A Light And It Never Goes Out.